The 1st is carved from cherry wood from the farm in Catalunya. It was carved from the point where a branch forked from the main trunk and therefore follows the natural curve of the grain. The next is a large pipe. Eating spoon from Red Cedar. Feels beautiful in the hand £16. A bowl made from an Almond burl. This. Took. An. Age. Serving spoon from Red Cedar. Hello. Welcome to my new blog. I will be using it to display and sell my wares. Lately I have been making lots of crochet hooks. Each is hand carved from carefully selected hardwood from a variety of sustainable sources. These latest hooks have been carved from Ash and Box. Ash for the larger diameter hooks and Box for the finer ones. Each are graded in mm, and I am making them in half milimeter increments (e.g 4, 4.5, 5...). The Ash wood for these hooks was taken from a wind blown tree on the Somerset levels, and the Box came from a couple of different sources. One was another casualty of the recent storms - an ancient Box tree near Abergavenny that losts its crown, but supplied me with some sizeable chunks of wood; the rest was a gift from a former Columbian cowboy, now a small-holder in rural Catalunya, where I was recently living for 8 months. 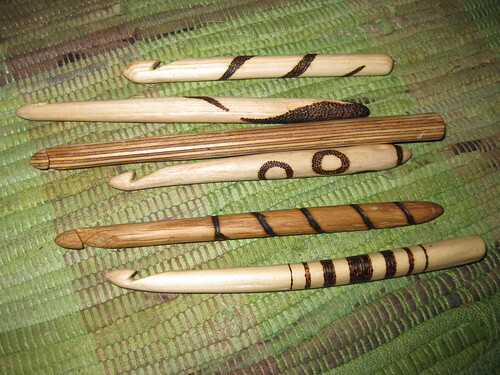 Box wood is our hardest native wood, which makes it perfect for fine items such as these crochet hooks. Some of the Box wood is beautifully figured, with lovely swirling patterns, but all of it is very difficult to work, and I sometimes have to resort to files rather than a knife in order to shape it. Unfortunately, I do not currently have my camera and so am unable to post any photos of my current work, but here is a photo of some of my past creations. My current hooks are undecorated, but I am happy to do pyrography work on commisions.